Marion M. Walsh, Esq., a partner in the law firm Littman Krooks LLP, will be speaking at the COPAA 2019 Annual Conference on March 9. She will discuss strategies that she has honed in her legal practice to help students receive appropriate services in cases where districts have failed in their obligations. 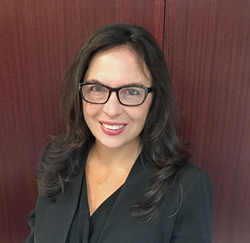 Littman Krooks Partner Marion M. Walsh, Esq. “I am honored to present before a national audience to share the important work we are doing. Access to this information is essential for parents and students and. I feel a responsibility to ensure that parents understand these important issues," says. Marion. Marion M. Walsh, Esq., a partner in the law firm Littman Krooks LLP, will be speaking at the COPAA 2019 Annual Conference on March 9. COPAA, the Council of Parent Attorneys and Advocates, is a national organization with a mission is to protect the legal and civil rights of students with disabilities and their families. Marion’s presentation is entitled, “How to Build and Litigate a Child Find Case for Students with Emotional Disabilities Who Cannot Attend School and Pitfalls to Beware.” She will discuss strategies that she has honed in her legal practice to help students receive appropriate services in cases where districts have failed in their obligations. “Unfortunately, many districts do not meet their obligations to evaluate and support students,” says Marion. While there is training and support, often there are not sufficiently individualized programs. Even many caring school professionals do not understand the child find obligation for students with mental health issues and miss the signs that a child needs services. In a scenario that happens too often, a student may have excellent grades in one quarter and then, if suffering from major depression or anxiety, may stop attending school and may even require hospitalization. By then, without appropriate school support, parents, upon hospital recommendations, may place their child in an appropriate therapeutic school and seek reimbursement for the tuition. “With earlier interventions and with more programs, it’s more likely a child will be able to stay in their public school district,” says Marion. Parents with children suffering from mental health concerns often feel alone and devastated. Parents need to know that the school district is obligated to identify, evaluate and appropriately support these students, and to learn how to advocate for them. Today, statistics show an epidemic of mental health concerns in young people. One in five children are diagnosed with a mental health disorder each year. Suicide is now the second leading cause of death among young people 10 to 34, according to the CDC. Depression is the leading cause of disability world-wide. “School districts are overwhelmed and often, in the most complex cases, underestimate student needs," says Marion. Marion is a frequent speaker with parent and advocacy groups in New York. This is the first year that she will be speaking at COPAA. “I am honored to present before a national audience to share the important work we are doing. Doing this seminar is particularly important to me, given the misunderstandings in the law. Access to this information is essential for parents and students. I feel a responsibility to ensure that parents understand these important issues," Marion says. Marion focuses her practice in special education advocacy, with a particular focus on mental health concerns for youth. She is a member of the Board of Directors of NAMI Westchester to help support families. She also volunteers to speak to youth and families through NAMI’s Ending the Silence program to alert students and families to early warning signs of mental health concerns and suicide risk and on how to get help. To learn more about Marion M. Walsh, click here. Littman Krooks LLP provides sophisticated legal advice and the high level of expertise ordinarily associated with large law firms along with the personal attention and responsiveness of smaller firms. These ingredients, which are the cornerstone of effective representation and necessary to a successful lawyer/client relationship, have become the foundation of the firm’s success. Littman Krooks LLP offers legal services in several areas of law, including elder law, estate planning, special needs planning, special education advocacy, and corporate and securities. Their offices are located at 655 Third Avenue, New York, New York and 399 Knollwood Road, White Plains, New York. For more information about Littman Krooks LLP, visit http://www.littmankrooks.com.